A mystery donor told Walmart employees he likes to do something special on his birthday every year. This year, he spent his special day visiting two northeast Ohio Wal-Marts and paying off the stores' layaway tabs. That's $106,000. He made it very clear he wanted to remain anonymous. Steelyard Commons had the biggest layaway collection with $70,000 in goods and Lorain had $36,000. Items ranged from a pair of socks to 70-inch televisions — and tons and tons of toys. Tara Neal had paid off $10 on a 'Frozen'-themed bed for her 3-year-old daughter when she got the call Tuesday morning that her layaway gift had been paid off. With four kids at home, she said the holidays can be tough. "It’s such a blessing to know there are still people out there that care. It’s like Santa, like a real Santa to me," Neal said. "I just cried," added Cathie Cromwell, who was picking up her son's gift. "It’s amazing someone would have this much compassion during the Christmas season to help us. To help people who maybe wouldn’t have had Christmas." This isn't the first time local do-gooders have paid off layaway tabs. 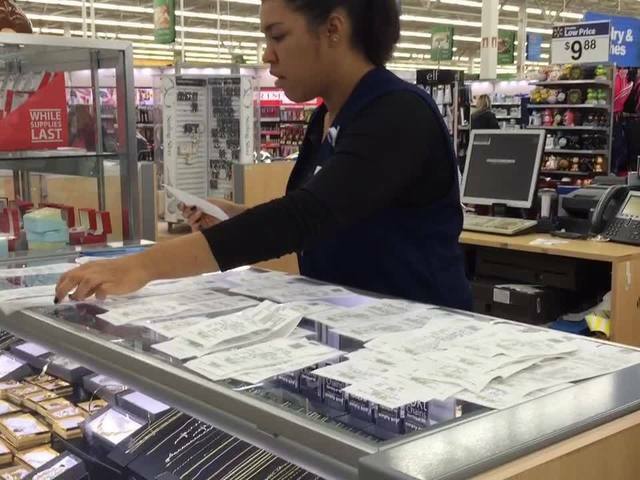 In 2013, someone paid off $8,800 at the Avon Walmart. And in southern Ohio, last year, someone paid off $15,000 at a Moraine store and in 2012, the Cincinnati Enquirer reported that a former shoplifter paid off $1,000 in goods at a Lockland store.